Let’s talk about coffee. Not coffee the plant, nor coffee the seed; coffee the drink. When we talk about “just a cup of coffee,” what are we referring to? Is espresso a coffee? Is a Chemex a coffee? Confused? So are the professionals. Today, we’ll explore coffee the drink in the context of the shop. Coffee’s desirability as a stimulant as well as its widespread cultivation and consumption by way of the age of exploration and colonialism has produced a variety of cultural styles of coffee brewing. Various methods of brewing have been designed and refined over the years to match the demands in price, style, and culture of the people who demand it. Old methods like Turkish coffee remain culturally popular; Italian espresso revolutionized coffee consumption; English consumption led to a long string of improvements in home coffee brewing. What makes a strong cup of coffee? For some, it’s a dark and robust drink that is both bitter and sweet like a dark wine. For others, it’s about being able to feel your heartbeat after the first sip. If we’re talking about caffeine, our pourovers have generally the same amount of caffeine as standard brewing recommendations for home coffee pots. Two “scoops” or tablespoons is around twenty grams; our dose for a single pourover on the Stagg XF Dripper. When we talk about the taste or body of the coffee, factors like origin, roast, brew method, extraction come into play. Just like apples grown in different regions or different varieties, coffee can vary in flavor depending on country of origin, coffee cherry variety, or processing method. 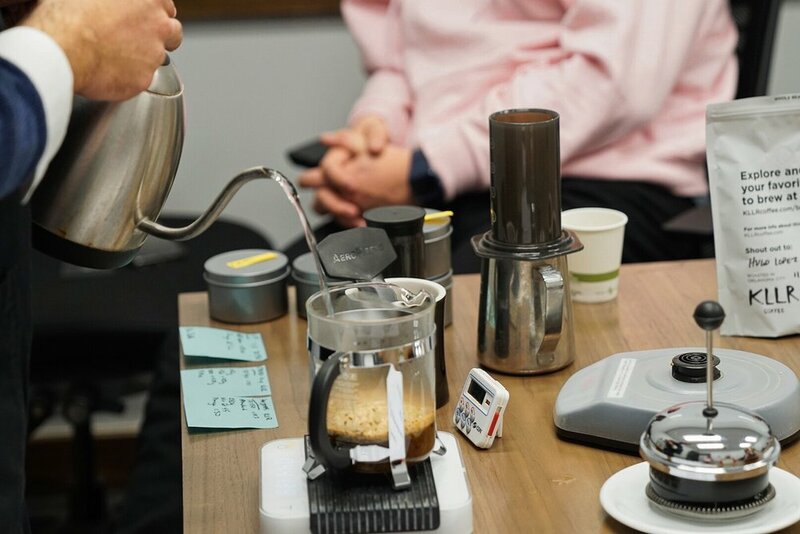 Just like a specific coffee on pourover might taste a little different than what it tastes like on espresso, there can also be a difference in flavor between your usual brewing method at home or work versus a cup from the shop. A lighter bodied cup doesn’t necessarily mean less caffeine or a weaker cup. Further, home brewing options like a French Press, Aeropress, or Moka Pot, might give you the style of coffee you’re looking for at home! As a drink in any form, coffee is a solution in which certain soluble particles are dissolved from the roasted coffee bean by water. Extraction, the process of pulling out those water-soluble coffee particles from the ground coffee bean, is the chemical process of making coffee. The goal of coffee-making, whether espresso, coffee pot, or pourover, is to extract as much of the good tasting coffee particles while also not extracting as little of the not so good tasting coffee particles as possible. We use variables like water temperature, grind size, and time to manage the extraction process. While there are a variety of different brewing methods and desires for flavor in coffee; coffee made well or evenly extracted, should also be the goal. In our desire to serve really good coffee, we make each coffee by the cup to ensure freshness, quality, and consistency. Our friends over at Modbar & Fellow help us provide these standards.